Todd: So Tres, lots of people might want to know when is the best time to visit the United States season-wise. What would you recommend to somebody that might go to America? 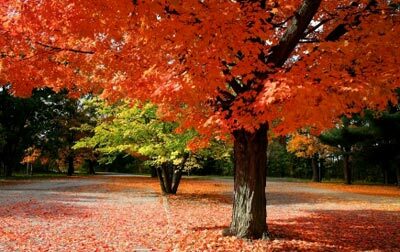 Tres: Definitely the best time is in the fall part of the year: end of August through end of November, beginning of December. The reason why is because the weather is beautiful. You have blue skies almost every day. There’s not too much rain, no tornadoes or hurricanes that come through, and the weather is just generally cool and pleasant. On top of that you have the amazing food that’s associated with the fall months and the holidays also take place then. For example, Halloween, we go door to door trick-or-treating, receive a lot of candy. There’s also Thanks Giving, where many families cook the traditional turkey. Some other families have chop-suey, what have you, and there’s also the tofu-turkey. Todd: Have you had tofu-turkey? Tres: I’ve never had a tofu-turkey but I’ve only heard about it. I went to a little arts college where there were only a few meat-eaters. Tres: I always heard about it. Also in the fall it’s a great time to visit the out doors in the United States. You have fall foliage. Especially if you’re in the New England States, where the mountains are just “on fire” with the oranges and yellows. Todd: Yeah, it’s nice. Nice time of year. OK, and any other season you think is a good time to visit? So the fall’s really good. Tres: I think the fall’s great. It also depends on personal preference. If one really likes the summer atmosphere, then of course going to New York or the West Coast in the summer time is great. You can visit the beaches. If you like skiing, of course winter is great, if you go to any of the Rocky Mountain States. Colorado for example, you can really take advantage of the snow out there. Great powder. Todd: Have you traveled much in the United States? Tres: Ever since I was a child, I’d get in the car and travel with my parents. We’d drive from OKlahoma to New York, or down south to the Pacific Northwest. Almost every single state. Maybe five, six states that I haven’t visited. Todd: OK sounds good. Thanks Tres. Lots of people might want to know when is the best time to visit the United States season-wise. Season-wise, the summer is my favorite, but my favorite month is December. He was not appropriately dressed season-wise. You do not wear shorts in the winter. The amazing food that’s associated with the fall months. The weather is the best during the fall months, especially when the leaves change color. You need to wear a sweater at night during the fall months. For example, Halloween, we go door to door trick-or-treating. He rode his bicycle to go door to door more quickly. Instead of calling customers, the salesman preferred to go door to door. Some other families have chop-suey, what have you, and there’s also the tofu-turkey. The room was full of garbage, candy wrappers and what have you. The house was beautifully decorated with expensive rugs, large mirrors and what have you. In the fall it’s a great time to visit the outdoors in the United States. You have fall foliage. The foliage outside her house is so thick that she can't see her neighbor's house. There was a lot of foliage growing around the old building. , this is the worst time to visit the northern part of the country. You will probably spend most of your winter inside the house. My grandfather was a to door salesman when he was younger. In the winter you can see the highway, but in the summer there is too much and you can't see anything. We always have a lot of food at family parties, like meat, potatoes and what .